I love my Chumby linux-enabled alarm clock, but I don’t love how bright the dang thing is in my bedroom in the middle of the night. It could double as a very effective (but very unwanted) flashlight. The Chumby has a night-mode, but it is generally enabled by using a fixed time. That would be great if I went to bed and got up at the same time each day, but I don’t. Yes, using a propeller professional development board is a little overkill for the project, but it’s what I had on hand and will suffice until I can make something a little smaller. 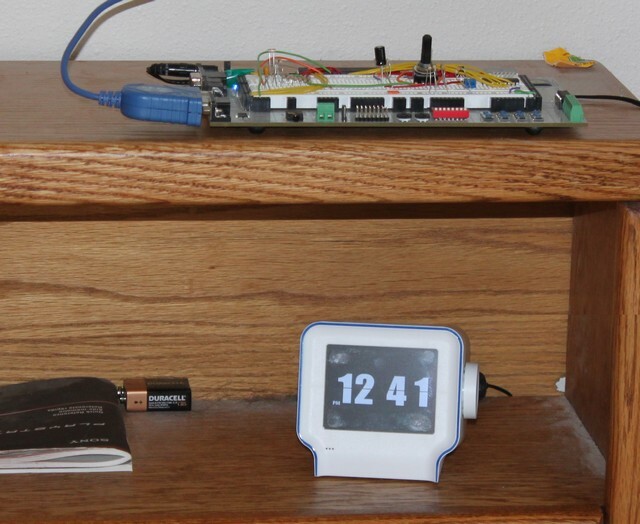 The second part of the hack is a small bash script that runs on the chumby. It reads from a USB-Serial adapter at /dev/ttyUSB0. If it reads an “L”, then it sets the display to bright. If it reads a “D”, then it sets it to dim. There are ways to automate execution of the script on startup and I’ll probably do that. In the meantime, my chumby is battery-backed-up during outages, so it’ll never get rebooted anyway. Everything needed to do it except the photocell is in the propeller education kit… I might try to prototype it on the PEK, just to show the minimalist approach. The photocell actually used to be in the PEK, but was removed due to ROHS restrictions. Nevertheless I got mine before then. I guess I like to live dangerously. The remaining thing that needs to be done is to turn off the annoying blinky light on the USB-Serial. 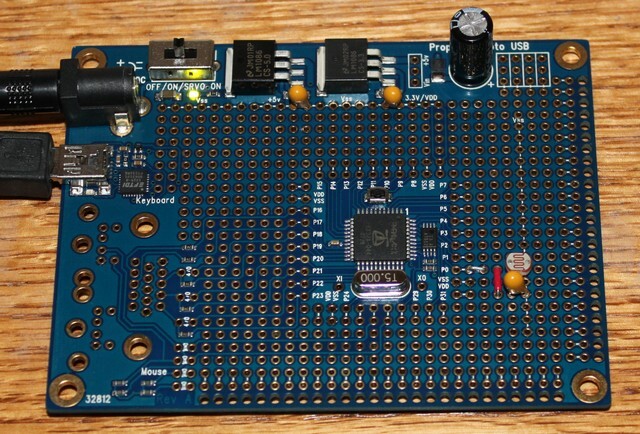 The proto-board uses an FTDI FT232R chip, and FTDI produces a tool called ft_prog that can be used to reconfigure the lights. I set the output for C1 to CBitBangI/O and that appeared to turn off the LED. You don’t need to mess with C0, as that LED is only used when data is received by the prop, which only happens (in our case) during programming. Using the USB proto-board, we have a nice little implementation of the circuit.